After 8 years in the Launch Out Formation Programme, Cardinal John Dew has now endorsed Fiona Rammell to carry out formal Ministry within the Church in this Archdiocese. 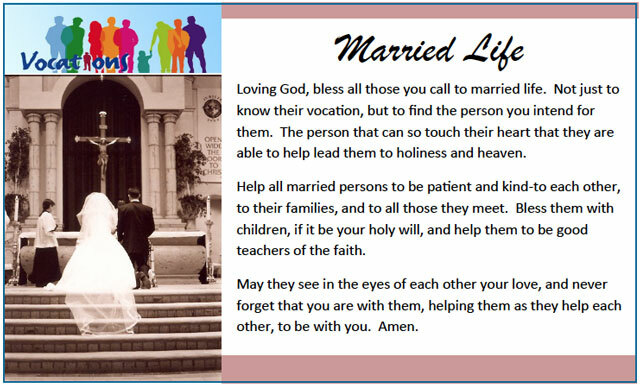 On behalf of the Cardinal, Father Maleko will present Fiona with her endorsement certificate at the 10.30am Mass today 5th March 2017. 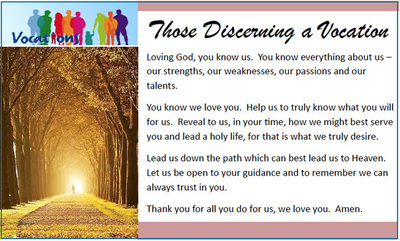 This is a significant day for Fiona, her family, the Launch Out candidates, our Parish and the Archdiocese. Fiona has chosen to receive her certificate in her Parish as an acknowledgement of the support and encouragement she has received from her faith community. 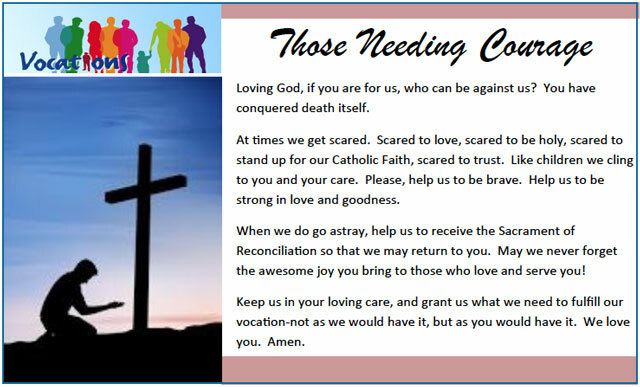 This year the Sacraments of Reconciliation, Confirmation and Eucharist will be available for children who will be 8 years of age by 23 September. There will be a meeting today Sunday 5 March at midday in the Church Foyer for all interested families. Parish Pastoral Council members are elected by their fellow parishioners for a period of 4 years. To preserve continuality elections are held for five members every 2 years. Councillors who have fulfilled their 4-year term (and are not eligible for re-election at this time) are Elsie Anderson, Robbie Baltazer, Clare Couch, Bill Kirkup, and Roman Zarate. Teresa Homan and Pat Salandanan. Peter Dawson, and Peter Briesman replaced Councillors who retired during their term of office. They also have 2 years to serve. Due to the School Mass being held next weekend Nomination weekend is now 14/15 June. This will be an opportunity for all to put forward whom they would like to nominate. Nominations will close Friday 20 June at 12 noon. Elections will be held after Nominations close to fill the 5 vacancies. 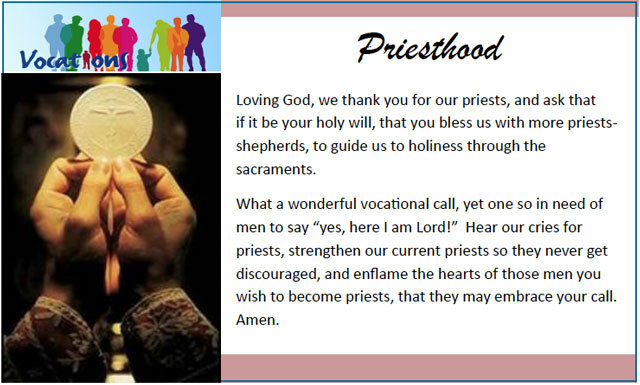 The parish will begin a programme where the parish is asked to pray for vocations. Not just for the Priesthood, but for all those in vocation or discerning their vocation calling. Prayer cards with a specially-made stole and candle will be given out to a parishioner/family weekly at each of the Masses, and they'll be asked to pray that week in a special way using the cards. 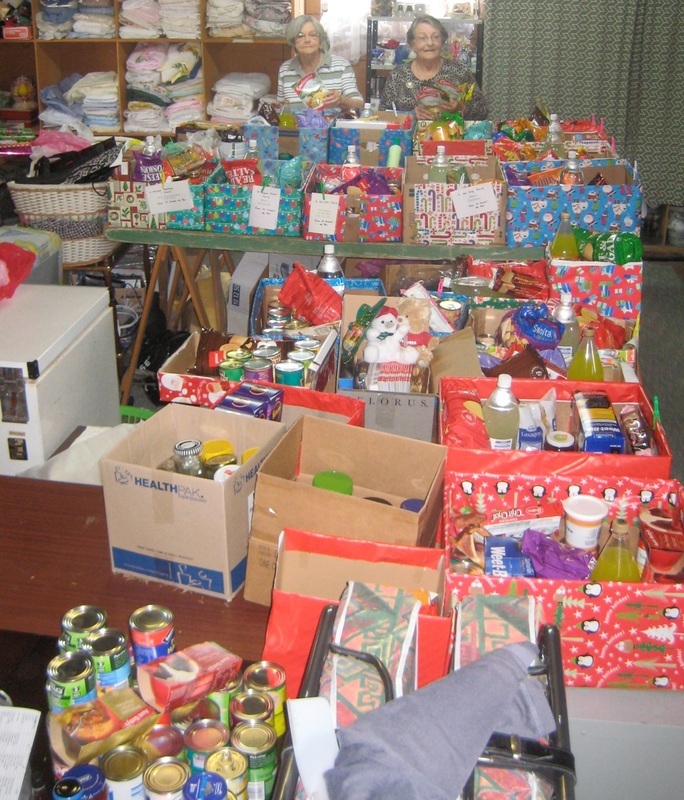 Then, they return the items the following week, to be "passed on" to another family. The starting date is being finalized but should be in mid-February. Also, signup sheets will be put in the back of church for people to sign up for weeks they would like to do the prayers. 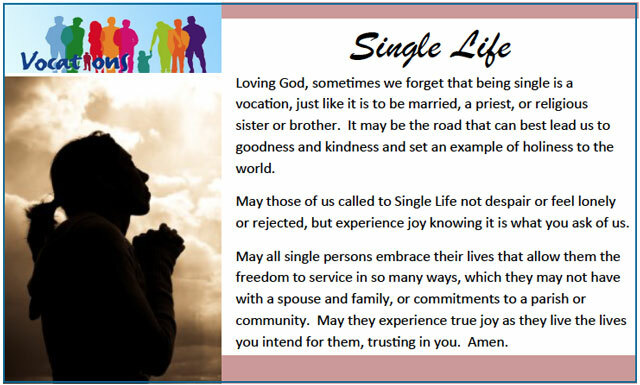 The prayer cards available are listed below. 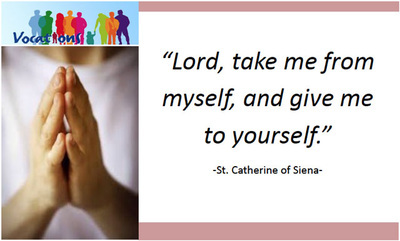 The prayer of St Catherine of Siena will be on the back of the prayer cards. Click on the cards to enlarge. November 2013 Upper HuttExhibiting themed Art and Crafts work, accompanied by music, song, poetry and story-telling was the innovative response of some people to a call from the papacy to 'Share Your Faith' in this Year of Faith. 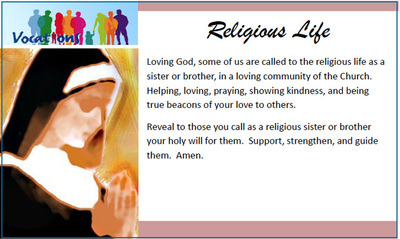 In Upper Hutt recently many Art and Craft exhibits explored this general theme by addressing the question 'what does my faith mean to me' in visual form? Items painted, sculptured, sewn, embroidered, carved, chiselled, laser and gas axe cut, moulded, photographed, sawn, hammered, woven, knitted, glued, baked and iced clearly demonstrated not only the diversity of the exhibitors but the wide variety of skills involved in showing the answer. 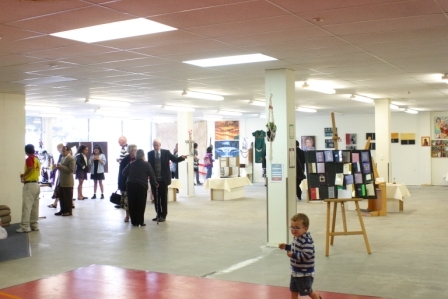 Many folk from surrounding Catholic parishes in the Wellington and Wairarapa joined with the initiating parish, St Joseph's Parish Upper Hutt to create this event of objects demonstrating what faith meant to the exhibit creators. St Joseph's Parish Priest Father Ron Bennett in taking up this initiative by encouraging committee chair Teresa and husband Stewart Homan stated that he was excited by the fact that the event “...has really been a 'conversation' with the people of Upper Hutt, a place where churched and unchurched folk, people coming from different faith backgrounds and 'no-faith' backgrounds can come together and have 'conversations' under the common themes of Arts and Crafts” in this Year of Faith. If it was considered a bit of an experiment in exhibiting themed objects of art and craft to initiate conversations both within the community of faith and to the wider community it was a success judging by both exhibitors and viewers alike who stated 'look! we have to do it again – and soon'. In one way the answer to the question 'what does my faith mean to me' seemed to be stated a lot 'louder' precisely because the answer was not found in just more talking. Instead it was a more reflective response that allowed the artists and crafters to state “here, we don't want you so much to just listen … but look first, look at what we have created as our answer to this, and then by all means talk too -if you wish." “We see no reason why this could not continue to be a regular event in the life of our parishes and community” stated Teresa. Sacred Heart, Reefton and St Canice, Westport are to become one parish with two Priests (or a Priest and a Lay Pastoral Leader) based in Westport. This will happen when there is no longer a resident priest in Reefton. 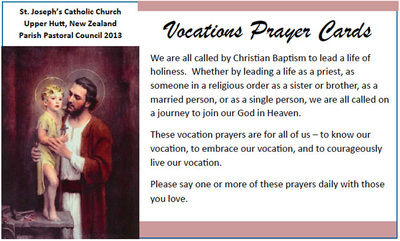 St Joseph, Levin and St Mary, Otaki will become one parish, to be staffed by the Priests of the Society of Mary. Ss Peter and Paul, Lower Hutt, St Martin de Porres, Avalon, St Bernadette, Naenae and St Michael, Taita are to become one parish. “One Parish – Four Churches” Effective from 1st February 2015. Sacred Heart, Petone, San Antonio, Eastbourne, Our Lady of the Rosary, Waiwhetu, and St Patrick, Wainuiomata are to become one parish. The parishes will remain as a Pastoral Area. Our Lady of Perpetual Help, Richmond, Sacred Heart, Takaka and St Peter Chanel, Motueka are to become one parish. 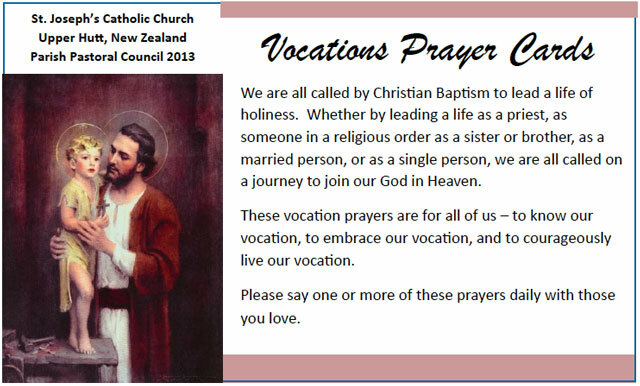 This is to be effective when there is no longer a resident Priest at Motueka. St Mary, Nelson and St Francis of Assisi, Stoke parishes are to become one parish at a time when it is no longer possible to have a resident Priest in each parish. St Mary, Blenheim and St Joseph, Picton are to become one parish, but will be dependent on the availability of a Priest at Picton. Sacred Heart, Kaikoura will remain on its own for the moment, but at the time when there is no longer a resident priest available it will become part of the one parish. Our Lady of Grace, Heretaunga and St Francis Xavier, Stokes Valley are to become one parish. This is to be effective as from 1st February 2015. St Joseph, Upper Hutt is to remain as a stand-alone parish. The parishes will remain as a Pastoral Area. This is to be effective from 1st February 2015. Holy Family, Porirua East and St Theresa, Plimmerton are to remain as stand-alone parishes. Te Ngakau Tapu, a parish personal to Maori, is to remain as a stand-alone parish. The parishes will remain as a Pastoral Area. St Patrick, Masterton, St Mary, Carterton and St Teresa, Featherston are to become one parish. Sacred Heart Cathedral Parish and St Mary of the Angels are to remain as stand-alone parishes. St Teresa, Karori and St Thomas More, Wilton are to become one parish, to be known as the Catholic Parish of Otari, to be effective as from 1st April 2014. 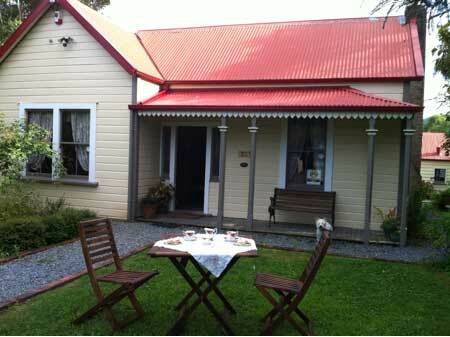 To raise funds for the upkeep of this unique historic cottage in Upper Hutt.